I had a meeting with a business mentor last week (a McGill professor who has started dozens of companies). He helped me realize the most important thing for the company right now is growth—not margins. The success of Minireference Co. depends on how many students read the book by the end of this year, and by the end of the next. We’ll work on the margins once we have scale. Below are some observations about book pricing for optimal growth. Since I listed the book on amazon.com/.ca/.co.uk/.de/.fr, all the print book sales have gone to them (mostly .com but a bit of .co.uk). Why would you buy the book from lulu.com for \$29 when you can get it from amazon for \$25? People are not stupid, even though I link to lulu.com from the main site, they all go to amazon to check if it’s available and order from there. To be honest, I think the print quality of the books from lulu.com is superior to the book produced by amazon CreateSpace and IngramSpark. I think lulu.com has been in the “print on demand” business for the longest of the three companies, so they know what they’re doing. The print quality of lulu books is very uniform and crisp, unlike the CreateSpace version which had some pages in darker ink and some in lighter. The main reason why I like lulu.com is because their paper is thinner, which makes the 445pp book actually look much more approachable; we’re talking about a difference of 3-4 mm in overall thickness, but the psychological effects are important. How can I communicate this difference to my readers? Maybe something like “I recommend you purchase the book through lulu.com, because of the higher print quality and thinner paper” could do. Though is this better print quality worth the \$4 extra, which is really \$10 extra when combined with the shipping. I guess I should tell my readers the facts, and let them decide for themselves. The other new channel I’ve been working on is the “serious” distribution to bookstores via Ingram. Printing through IngramSpark makes the book available through all kinds of online distributors (e.g. barnesandnoble.com) and also makes the book available to order from the Ingram catalog, which is how most physical bookstores order their books. The list price is \$29, and the printing cost are \$6.7, which means there is \$22.3 of “value” to split between me, Ingram, and the bookstore. There are two options for the wholesale discount I can offer 55% wholesale discount (bookstore margin: 35%-40%) or offer 40% wholesale discount (bookstore margin: 20%–30%). If I provide a wholesale discount of 40% (a.k.a short discount or academic discount), the wholesale price is 17.40, which leaves me with 17.40-6.7 = \$10.7 of profit per book sold. If instead I offer 55% (industry standard, a.k.a trade discount), the wholesale price will drop to \$13.05, which leaves me with 13.05-6.7 = \$6.35 gains per book sold. After yesterday’s conversation with my mentor, I’m switching to the 55% discount. Give everyone a cut. We’ll jack-up the prices when everyone is hooked on the knowledge buzz that learning mathematics provides 😉 . 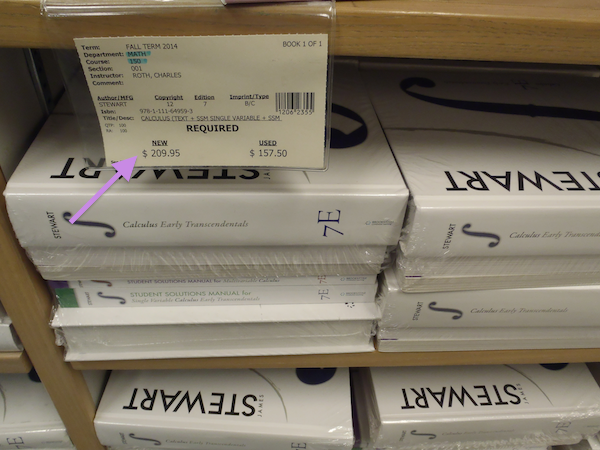 In parallel to the print book distribution, there is the question of eBook pricing. Both the print book and the eBook version have been \$29. Historically, eBook sales have been very good to me, but ever since the book has appeared on the amazons, the eBook sales have slowed to a trickle. Why would you buy a eBook for \$29 if you can get the print book for \$25? The other consideration to keep in mind in the face of these price deviations from the old price of \$29 is the psychological effects of “perceived value” of the book. How could this be a good book if it’s just \$25? 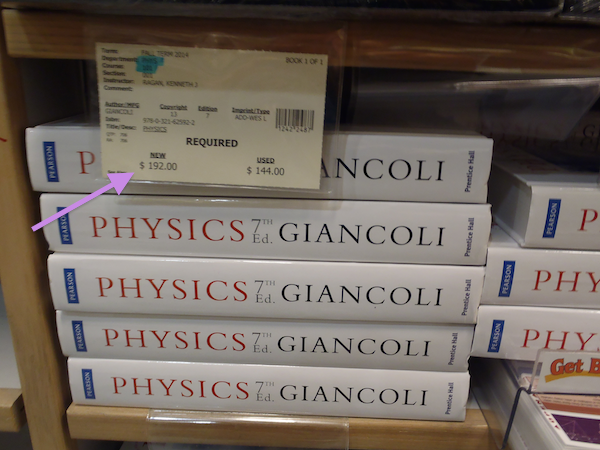 Mainstream university-level math and physics textbooks cost hundreds of dollars. 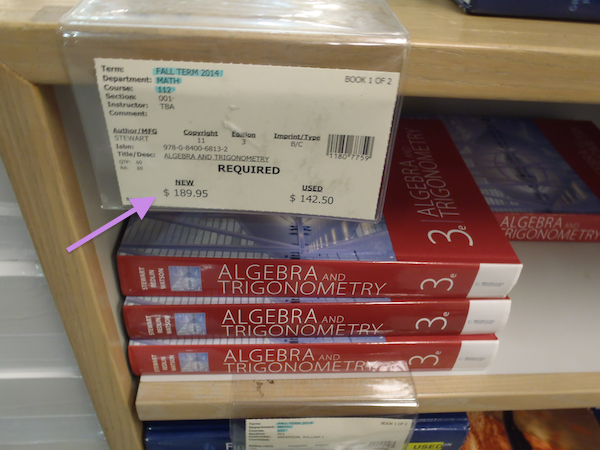 Specifically, \$190 for precalculus, \$209 for calculus, and \$192 for physics. How can your book cost only a fraction of that and be of comparable quality? No way, I don’t believe it! I had picked the price \$29 to be as low as possible (looking out for the student’s interest) while still making the book business profitable for me. As the price is dropping below \$29 due to discounts, the situation with the “this book looks suspiciously cheap” problem is getting worse. I might think about bringing the price up to \$39 for the 6th edition, to better communicate the value. There is a general lesson to learn here, which is advice I’ve heard from several successful entrepreneurs, but I never took seriously until now. Price your products for growth not profit. You might lose some money at first, but reaching a wider audience is worth much more than short term profits. Hola! Regardons ensemble un peu de code. The binary_search algorithm. It will get a little technical, pero no es mucho complicado. A ver. En ingles. En anglais, parce que le code—ça va foule mieux en anglais. Assume you’re given a array of integers sorted in increasing order [3,6,19,21,87]. You job is to write a “search” function that returns the 0-based index of query value, or -1 if val is not in array. The “usual” algorithm use the start and finish pointers in a weird way, which I found difficult to understand, so I wrote another one. The invariant “we’ve already checked the limits” feels more logical to me. The pleasure of implementing binary search in python is left to the reader. I just read an interesting account of what life is like for high school students. An adult shadowed a student for a whole day, going to class, taking exams, sitting all day, etc. The article is definitely worth a read for anyone in ed. I liked the idea of structuring lessons starting from students questions. It wouldn’t work for 1-on-1 tutoring (a student may have only unknown unknowns) but collectively as a class, the set of all known unknowns probably covers a lot material that would make sense to cover in the current class. Here’s an idea. Rather than writing advanced software that “measures” the student’s level of understanding and schedules appropriate material for them, why not let students tell you what they do or do not know, and—more importantly—what they would like to learn. Update Oct 19: Grant posted an followup post.